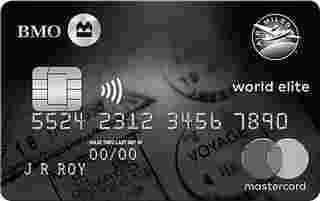 BMO Air Miles World Elite MasterCard is typically available to those with good credit scores (650 or greater). - In addition, get 1000 bonus miles after your first purchase. - VIP access to airport lounges worldwide with Priority Pass membership, plus two annual complimentary passes (a $150 value). Cardholders earn AIR MILES quickly with a big introductory bonus and fast accrual from most purchases, which they can redeem to cut their bills by hundreds or even thousands of dollars each year, all while traveling in style. Moreover, Mastercard and BMO protect customers and their purchases with a competitive package of insurance features. The BMO Air Miles World Mastercard is best for those who spend $20,000 annually (or more) and wish to collect Air Miles at a faster rate – and are willing to pay an annual fee of $99. The best feature of the card is that it gives you 1 Air Mile for every $15 spent and a 25% discount on the number of Air Miles required for flights. Overall the updated BMO Rewards World Elite Mastercard is much stronger offering than when it first came out and is a comparable match to its direct competitors. Booking fees on phone in rewards, a higher annual fee, and no ability to book travel directly from any provider makes this card fall short of ones like the TD First Class Visa Infinite and the Diners Club Mastercard.